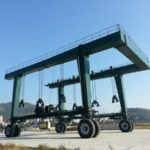 450 ton travel lift is a large lifting device with high safety. 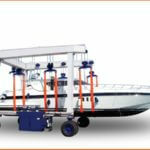 It is widely used for lifting and transporting boat. It is also applied for industrial use, such as loading and unloading steel tube and pipe in factory, warehouse, maintenance yard. 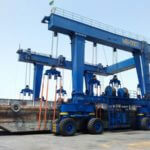 450 ton mobile boat hoist can increase working efficiency, save labor resource and improve working condition. 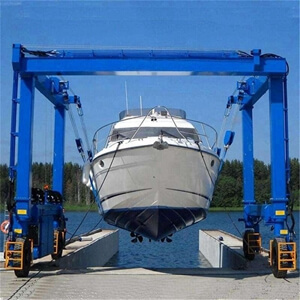 It can put heavy boat in the water, lift the boat from water or transport the boat smoothly and stably. 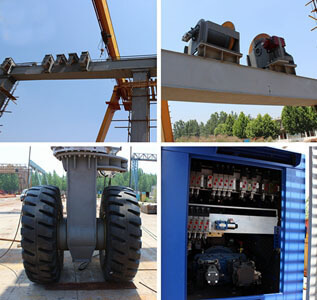 1.Electro-hydraulic transmission system includes hoisting and traveling parts. It has features as small volume, light weight, compact structure, smooth running, quick response, small inertia, easy operation and automation. The crane is able to high-speed start, brake and turn. 2.Multiple point hoisting disperses forces acting on the hull without strongly pressuring. 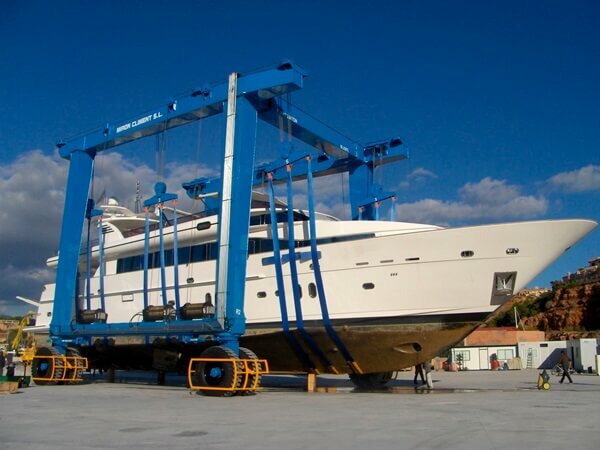 Movable hoisting points and dynamic balance are suitable for boats of different types and can automatically adjust the deflection angle for adaption. 3.Radar anti-collision method is safe and effective. 4.Adoption of load sensitive control technology enables the crane to produce output as actual demand to prevent energy waste. 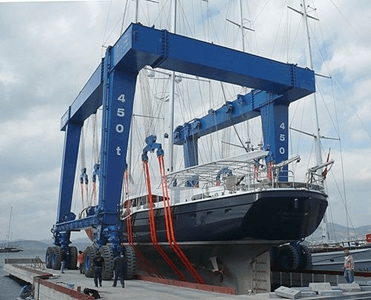 5.Soft but sturdy hoisting belts make no damage on hulls surface. 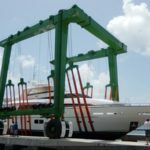 How to ensure safety of 450 ton travel lift? Restrict personnel in area to only those required for lifting operations. Restrict vehicular traffic from general area. 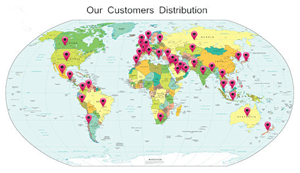 A minimum of two persons are required for any travel-lift operation, the operator and lift coordinator or spotter. The spotter serves as a second set of eyes and directs the operator in all lifting and traversing operations. The spotter must remain in clear view of the operator at all times and use hand signals to communicate with the operator. 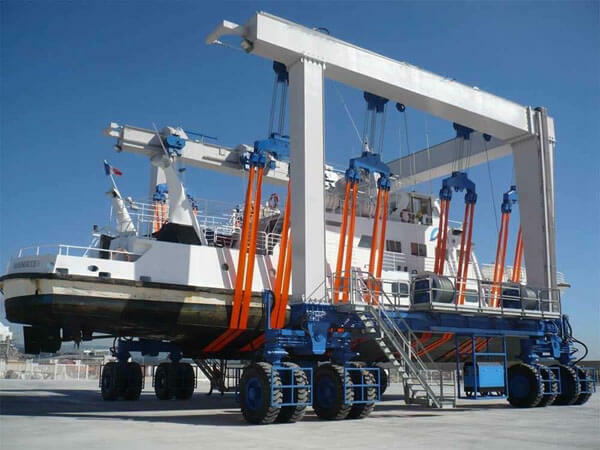 The operator uses the controls of the travel-lift to position the lift, raise and lower the slings and traverse the lift between the boat storage area and the lifting pound. The operator takes direction from only one person, the spotter, for all but emergency stop situations. The operator should never leave the controls while the engine is running. 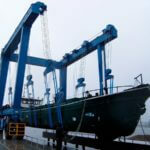 A vessel should never be lifted with persons on board. No lifting operations are to be performed in winds exceeding 60 kph. Special care and assigned personnel are required to guide the lift’s cable blocks in and out of the pound while raising and lowering empty slings. 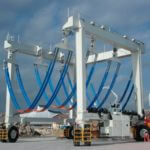 There is a risk that the blocks make contact while lowering and the load is temporarily removed. The wire rope may loose its position on the spool causing a dangerous overlap, possibly damaging the cable. When raising empty slings in the pound there is a possibility that the cable blocks can snag objects overloading the cable. While traversing, slings should never be allowed to drag. They should be either connected together above the ground or laid on the travel-lift’s frame.